Up to 60 Gbps Firewall, 10 Gbps VPN, 10.6 Gbps UTM; Basic configuration - 8 Gb Ethernet interfaces, 4 10 Gb SFP+, additional network modules available; unrestricted BOVPN, IPSec, and SSL tunnels; Redundant Power. *This unit must be used in conjunction with an active non-HA Firebox M5600 appliance. The Firebox M4600 and M5600 provide enterprise-grade security and industry-leading price/performance, with the ability to customize port configurations. Ideal as a hub appliance for headquarters with many remote locations to secure, the M4600 and M5600 give IT pros maximum flexibility to meet their specific network requirements. The Firebox M4600 & M5600 Series are recommended for corporate datacenters and distributed enterprises. Extend best-in-class UTM (Unifed Threat Management) security to the WLAN by adding WatchGuard's Wireless Access Points. *Throughput rates are dependent on network interface modules selected for your M4600 or M5600 deployment. 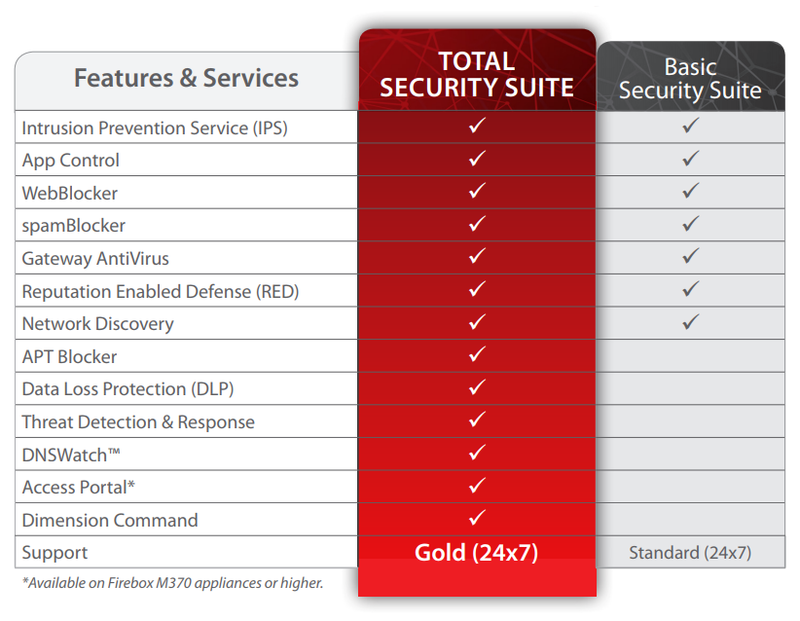 Download the WatchGuard Firebox M4600 & M5600 Datasheet (PDF). NGFW Suites include Standard Support, Application Control, and Intrusion Prevention Service.